This image is from the autumn of 1915 and shows men of the 2/4th Battalion London Regiment (Royal Fusiliers), then part of the Royal Naval Division, in the front line trenches at Gallipoli. 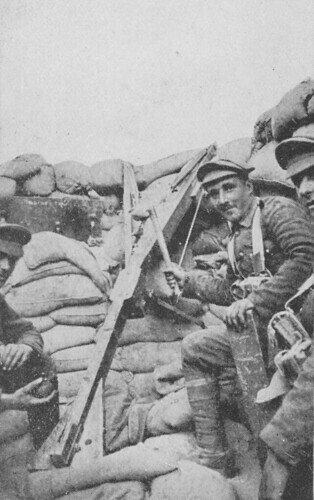 This weapon these Territorial soldiers are employing is typical of the makeshift weapons being used not only in the trenches of Gallipoli but the whole Western Front in France and Flanders. Catapult guns were employed from 1915 to allow soldiers to fire hand grenades or small explosive charges (often contained in jam tins) over much greater distances than they could throw them, or more often fire them from positions of safety as seen here. The weapon could be set up and loaded, then fired at the enemy positions. In most cases the sort of distance they were firing projectiles was only measured in tens of yards, which was also typical of conditions on the battlefield in 1915 when both sides often lived almost on top of each other. In this photo the officer on the left has a grenade in his right hand about to load it while the Private on the right has the contraption used to tighten the catapult. In his other hand is a box periscope, no doubt used to observe the enemy targets safely before firing. The 2/4th Londons stayed at Gallipoli until evacuated in late 1915 and then went to Egypt where they were disbanded, most personnel going to France to join a re-formed 1/4th Battalion which would go on to fight on the Somme. This entry was posted on 30/09/2012 by sommecourt. It was filed under Gallipoli, Trenches, WW1 and was tagged with 1915, Gallipoli, Grenades, London Regiment, Trenches. French soldier had something like that, called ” sauterelle” grasshopper. A great picture, Paul. Have you seen the picture of Indian troops on Gallipoli with a similar catapult? it’s in the NAM image collection http://prints.national-army-museum.ac.uk/image.php?imgref=929. My great-grandfather Martin Murphy was supposedly at Gallipoli (I assume with the City of London Royal Fusiliers as these were the only London regiment to fight at Gallipoli as far as I know) – he was injured and contracted Malaria but survived the war. Unfortunately we have no photos of him from this time period and I’ve not been able to find his military records or medal index. Are there lists of soldiers assigned to each regiment which I might be able to check?